Following Saturday’s fine 2-1 win over the Faroe Islands, Malta faces Spain in another match from Group F of the European Qualifiers leading to EURO 2020 at the National Stadium on Tuesday, kick-off at 20:45. The win over the Faroe Islands was the first competitive win at home in almost thirteen years and it was definitely a morale-boosting win for Ray Farrugia’s boys. But undoubtedly Spain are a much stronger side and although they lost two out of the four matches of the UEFA Nations League to finish second in a group which featured England and Croatia, they are now eager to end Group F on top. The clash between Malta and Spain brings back, especially for the Spanish fans, memories of the 12-1 win in Seville in December 1983 in the EURO ’84 qualifiers but somehow they forget that in that same campaign, seven months earlier, Spain had to sweat hard to beat Malta 3-2 at Ta’ Qali. Since then Spain had defeated Malta 2-0 in January 1989 and 3-0 in December 1996 in two World Cup qualifiers at Ta’ Qali. Addressing the media on Monday, Farrugia admitted it will be difficult but is looking forward for the game. 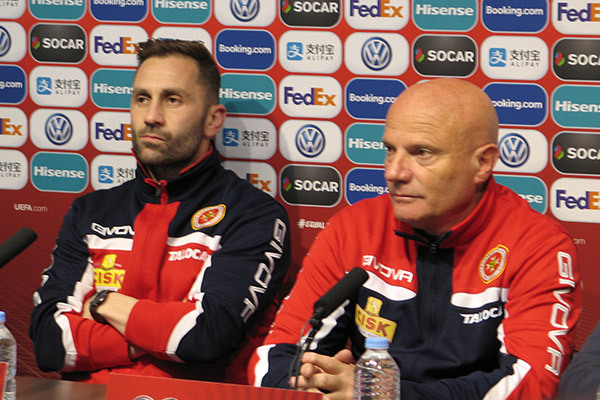 The Malta coach has not ruled out making further changes apart from the replacement of the suspended Andrei Agius. Henry Bonello should start in goal with Steve Borg, Jonathan Caruana and Zach Muscat and possibly Joseph Zerafa at the back, Rowen Muscat, Paul Fenech and Joseph Mbong in midfield with Juan Corbolan and Michael Mifsud supporting Kyrian Nwoko in attack. The Spanish media seemed interested in asking Farrugia only about the game in Seville. Farrugia was a member of that team but had to be substituted on the 72nd minute after sustaining an injury. Paul Fenech said the players were fully concentrated ahead of this game. Fenech added that although the squad now features several younger players, these were not short of experience and performances by players like Joseph Mbong and Juan Corbolan in recent matches and also Matthew Guillaumier on his debut were a clear example. Meanwhile Spanish coach Luis Enrique, who was appointed as national coach last summer, said he is not worried that in recent games, Spain seemed to struggle to score goals. “We had good start (a 2-1 win over Norway) and we need to stay focussed all the time. Luis Enrique brought his best formation to Malta which features players like David de Gea, Sergio Ramos, Jordi Alba, Alvaro Morata and Marco Asensio. David de Gea (Manchester United), Kepa Arrizabalaga (Chelsea FC), Pau López (Real Betis Balompié), Juan Bernat (Paris Saint Germain), Sergi Gómez (Sevilla FC), Sergio Ramos (Real Madrid CF), Mario Hermoso (RCD Espanyol de Barcelona), Íñigo Martínez (Athletic Club), Jordi Alba (FC Barcelona), José Luis Gayà (Valencia CF), Sergi Roberto (FC Barcelona), Jesús Navas (Sevilla FC), Dani Ceballos (Real Madrid CF), Saul Niguez (Atlético de Madrid), Rodri Hernández (Club Atlético de Madrid), Sergio Busquets (FC Barcelona), Daniel Parejo (Valencia CF), Sergio Canales (Real Betis Balompié), Marco Asensio (Real Madrid CF), Rodrigo Moreno (Valencia CF), Iker Muniain (Athletic Club), Álvaro Morata (Atlético de Madrid), Jaime Mata (Getafe CF). Spain’s attraction and Malta’s 2-1 win over the Faroe Islands on Saturday made sure that the National Stadium was completely sold out. Malta vs Spain will be controlled by referee Andrew Dallas of Scotland.